In this lesson, we will learn how to find the distance between a point and a straight line in the coordinate plane. Determine the length of the perpendicular from a point 𝐴 ( 𝑥 , 𝑦 ) 1 1 to the line 𝑦 = 0 . 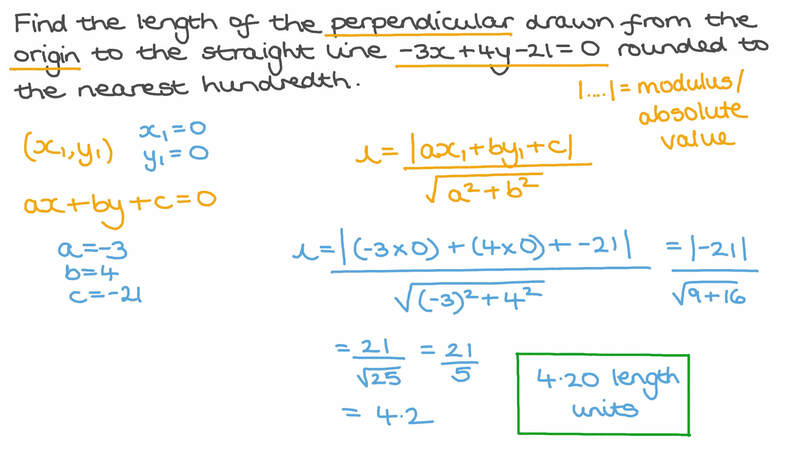 Find the length of the perpendicular drawn from the origin to the straight line − 3 𝑥 + 4 𝑦 − 2 1 = 0 rounded to the nearest hundredth. Find the length of the perpendicular from the point ( − 2 2 , − 5 ) to the 𝑥 -axis. Find the length of the perpendicular from the point ( − 1 9 , − 1 3 ) to the 𝑦 -axis. Find the length of the perpendicular drawn from the point 𝐴 ( 1 , 9 ) to the straight line − 5 𝑥 + 1 2 𝑦 + 1 3 = 0 . Find the length of the perpendicular drawn from the point 𝐴 ( − 1 , − 7 ) to the straight line passing through the points 𝐵 ( 6 , − 4 ) and 𝐶 ( 9 , − 5 ) . If the length of the perpendicular drawn from the point ( − 5 , 𝑦 ) to the straight line − 1 5 𝑥 + 8 𝑦 − 5 = 0 is 10 length units, find all the possible values of 𝑦 . Find all values of 𝑎 for which the distance between the line 𝑎 𝑥 + 𝑦 − 7 = 0 and point ( − 4 , 3 ) is 2 0 √ 8 2 4 1 . Find the length of the perpendicular line drawn from the point 𝐴 ( − 8 , 5 ) to the straight line that passes through the point 𝐵 ( 2 , − 4 ) and whose slope is = − 8 . What is the distance between the point ( − 9 , − 1 0 ) and the line of slope 1 through ( 3 , − 7 ) ? Find the perpendicular distance between the point 𝐴 ( 2 , 2 0 ) and the 𝑥 -axis. If the length of the perpendicular drawn from the point 𝐴 ( 7 , − 1 ) to the straight line − 5 𝑥 − 2 𝑦 + 𝑐 = 0 equals 2 4 √ 2 9 2 9 , find all possible values of 𝑐 . Suppose 𝐴 𝐵 and 𝐴 𝐶 are equal chords in a circle 𝑀 , where the coordinates of points 𝑀 , 𝐴 , and 𝐵 are ( − 9 , 0 ) , ( − 1 1 , − 2 ) , and ( − 7 , − 2 ) , respectively. Find the distance between chord 𝐴 𝐶 and 𝑀 . Let 𝐿 be the line through point ( 7 , 5 , 5 ) in the direction of vector ( 2 , 4 , − 9 ) . Find the distance between 𝐿 and the point ( 2 , 6 , 6 ) , to the nearest hundredth. Let 𝐿 be the line through the point ( − 6 , 8 , 9 ) that makes equal angles with the three coordinate axes. What is the distance between the point ( − 4 , 5 , 3 ) and 𝐿 , to the nearest hundredth. Determine, to the nearest hundredth, the length of the perpendicular drawn from the point ( − 5 , − 7 , − 1 0 ) to the straight line 𝑥 + 8 2 = 𝑦 − 9 8 = 𝑧 + 7 − 8 . What is the distance between lines ( − 1 6 , − 1 6 ) + 𝑘 ( 2 , 4 ) and ( 1 9 , − 1 7 ) + 𝑘 ( 7 , 1 4 ) ? What is the distance between the point ( 1 6 , 1 2 , 2 0 ) and the 𝑦 -axis? Find the shortest distance between the line 𝑦 = 1 and point 𝐴 ( 1 , 7 ) . Find the shortest distance between the line 𝑦 = 1 2 𝑥 − 2 and the point 𝐴 ( 9 , − 1 0 ) . Determine, to the nearest hundredth, the distance between the point ( 7 , − 5 , − 4 ) , the straight line passing through the point ( 0 , − 2 , 2 ) , and its direction ratios ( − 9 , 7 , − 5 ) . Find the shortest distance between the point ( − 6 , 1 0 ) and the line which passes through the points ( 1 , 9 ) and ( 4 , 6 ) . Determine the shortest distance between the line 𝑥 = 3 and the point 𝐴 ( − 8 , − 6 ) . Find the length of the perpendicular drawn from point 𝐴 ( − 8 , 1 , 1 0 ) to the straight line ⃑ 𝑟 = ( − 1 , 2 , − 7 ) + 𝑡 ( − 9 , − 9 , 6 ) rounded to the nearest hundredth. Find the length of the perpendicular drawn from the point 𝐴 ( − 9 , 5 ) to the straight line passing through the points 𝐵 ( 4 , 3 ) and 𝐶 ( − 2 , − 7 ) .